On October 2nd and 9th LHUCC will have a special collection for funds to help us maintain our status as a Friend of NAZ (Northside Achievement Zone). 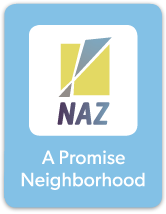 Twenty-three hundred Northside students are a part of the Northside Achievement Zone (NAZ). Please help us continue our proud tradition as a Friend of NAZ.